A bloody new chapter in the conflict between Israel and the Palestinians dramatically shifted the news agenda from domestic to foreign crises, dominating media attention in an otherwise crowded week of news. The Gaza fighting between Israel and Hamas, which escalated from aerial warfare to fierce ground fighting, accounted for 21% of the newshole from Dec. 29-Jan. 4, according to the weekly News Coverage Index from the Pew Research Center’s Project for Excellence in Journalism. Other than the Iraq war, the fighting in Gaza was the second-biggest overseas story for any week during the past two years. 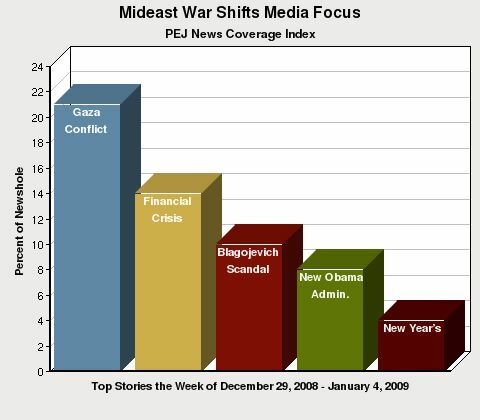 Only the brief and one-sided conflict between Georgia and Russia, which filled 26% of the newshole from Aug. 11-17 2008, generated more coverage. The new spasm of Middle East violence attracted significantly more coverage than the No. 2 story, the economic crisis, which filled 14% of the newshole. Although it had been widely believed that President-elect Barack Obama’s first priority would be working to mitigate that meltdown, last week’s events raised the possibility that the Gaza bloodshed could pose his most immediate challenge instead. Indeed, Obama’s response to that conflict — which has thus far been muted — was the biggest theme of the presidential transition (the week’s No. 4 story at 8% of the newshole). Sandwiched in between was a political sideshow that presented yet another headache for the president-elect. The fallout from the scandal involving Illinois Gov. Rod Blagojevich, which last week focused on his controversial selection of unlikely candidate Roland Burris to replace Obama in the Senate, accounted for 10% of the coverage. It was a week in which those top four stories all generated significant media attention and accounted for more than half the overall newshole. The new fighting between Hamas and Israel — which intensified with air attacks on Dec. 27 and escalated with the Jan. 3 ground invasion — offered no shortage of angles and challenges for the media. In addition to monitoring events on the ground, coverage addressed relevant issues involving both geopolitics and domestic politics. And then there is the thorny matter, in a conflict that stirs public passions like few others, of examining proportionality and context in a situation where one side is inflicting the overwhelming majority of casualties. The Dec. 30 Washington Post, for example, was careful to juxtapose front-page photos of a Gaza mother weeping over a daughter killed in an Israeli air strike with the image of an Israeli woman traumatized by a Hamas rocket attack. But the story beneath the photos, about a Gaza family that lost five young girls in the bloodshed, focused on the collateral damage to Palestinians. “Many of the casualties have been civilians who live around targets in the densely populated [Gaza] strip,” it noted. The subject of internal politics — both within Israel and the U.S. — was intertwined in the media narrative with the timing and conduct of the war itself. Israel also found itself embroiled in a fight over access to the battle after its decision to bar reporters from entering Gaza, leaving the press to cover the conflict from the Israeli side of the border. “Journalists have protested the ban as a grave blow to press freedom,” said an Associated Press story. The events in the Middle East, while still occurring on the watch of George W. Bush, had a major impact on the media narrative about the new administration — the question of how quickly they realigned Obama’s priorities. Although there was plenty of commentary and punditry about whether Obama needed to take a more hands-on approach to what was unfolding in Gaza, much of the Middle East-related coverage focused on the reshuffled geopolitical realities he would have soon face. Even with the war in Gaza and the impact on the new administration, the economy remained a major focus of the media last week, a frankly somewhat uncharacteristic example of media stick-to-itiveness. The economic crisis was the second-biggest story last week, and the key storylines included an early year rally on Wall Street, broad economic impact, the effect on industry and the effect on average Americans. At least one bright spot appeared last week with a New Year’s rally in a stock market ravaged by a very rough 2008. But the day after New Year’s, a buying spree pushed the Dow Jones over the 9,000-point mark and generated, at least temporarily, some positive economic news and the hope of a better 2009. “Wall Street opened a new year of trading with a big day,” noted the Fox News Channel’s Jim Angle, with a bit of a lilt in his voice, during a Jan. 2 newscast. The scandal that just won’t go away — the pay-for-play allegations surrounding Illinois Gov. Rod Blagojevich — opened a new chapter last week. After being accused of trying to auction off Obama’s Senate seat, Blagojevich — despite facing an impeachment threat and calls for him to step down — made his choice. And his decision dominated last week’s coverage of the increasingly convoluted saga that exploded into the headlines with the Dec. 9 arrest of Blagojevich. The governor’s selection of former Illinois State Attorney General Roland Burris — who had run unsuccessful campaigns for governor, senator and mayor of Chicago — created a Capitol Hill version of the movie “High Noon.” Fellow Democrats moved to block his appointment while Burris made patently clear his intention to travel to D.C. and be seated in the Senate. Given the continuing flap over the fate of Obama’s Senate seat, three major principals in that story were the top newsmakers during the week, according to PEJ’s News Coverage Index. Obama was No. 1, followed by Blagojevich. Burris, who emerged from obscurity to suddenly become — possibly — a U.S. senator, was next. 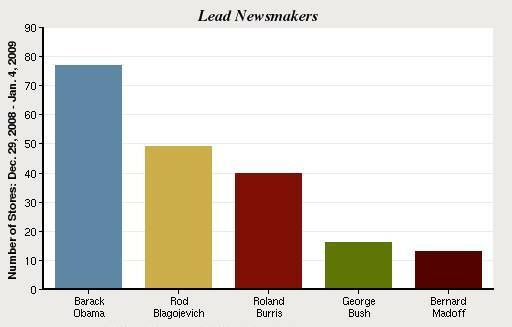 Rounding out the list of top five newsmakers was George Bush, who received a small percentage of the coverage his successor got. And Bernard Madoff, the alleged perpetrator of a massive Ponzi scheme, was No. 5. Given the coverage of the top four stories last week, there was limited room for much else on the media menu. The No. 5 story was a seasonal perennial, New Year’s celebrations, at 4% of the newshole. Another story driven in large part by traditional year-in-review analyses, a recap of the presidential election season, was the No. 6 story at 3%. The bottom half of the top 10 story list included the two wars the U.S. is currently engaged in — Iraq (No. 7 at 2%) and Afghanistan (No. 8 at 2%). The troubled U.S. auto industry, a theme closely related to the economic crisis, was the ninth-biggest story, also at 2%. And rounding out the list was coverage of immigration issues, which finished No. 10 at 1%. Each year, PEJ examines the methodology of the Weekly News Index to ensure that both the content studied and the weights applied to each media sector reflect developments in how Americans consume news information. For 2009, PEJ made two adjustments, which went into effect on January 1, 2009. First, we updated the weighting system used to combine the calculations between the different media sectors. In recent surveys conducted by the Pew Research Center for the People & the Press the number of people who say they get their news online has increased. Consequently the weight given to online news stories has increased. Second, we increased from 5 to 12 the number of different websites included in our weekly coding.